Make an echeveria tower this Christmas! Get a piece of chicken wire at least 1,5m long. You can buy wire by the metre from your local Builders. Depending on how high you want your echeveria tower to be, choose 600mm-, 900mm- or 1,2m-wide wire. Begin by shaping the wire into a cone, with a large base and narrowing to a point at the top. Don’t cut off the excess wire, simply bend it round the cone and back onto the wire to secure it – this gives your cone more stability. Secure the join in the chicken wire with a few short cable ties. You’re now ready to start decorating. Grab your secateurs and a basket and start foraging in your garden for echeverias and other succulents. Start placing the succulents you found in the chicken wire holes, starting from the base and working upwards. This helps them all lean on each other for support. Finish off any gaps with some sphagnum moss, and viola! a stunning tree. When you are done with the celebrations, take all the plants and plant them back into the garden. 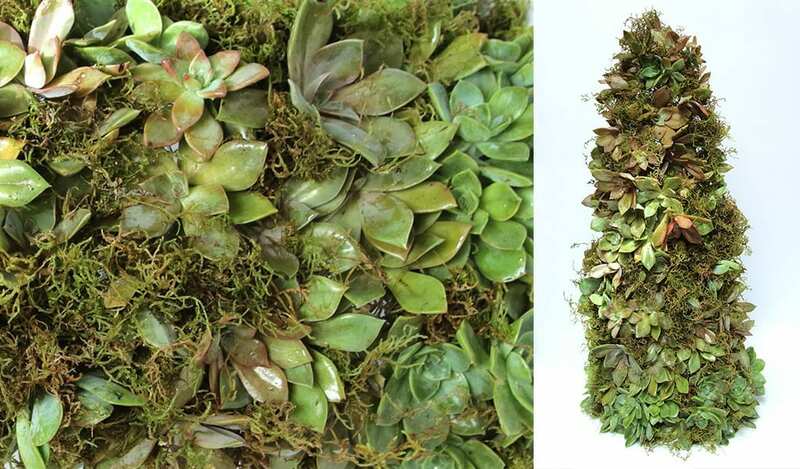 This entry was posted in DIY, Gardening Trends & Inspiration and tagged do-it-yourself, succulents. Thanks for the update. I’ve contacted the park to find out the story behind it.